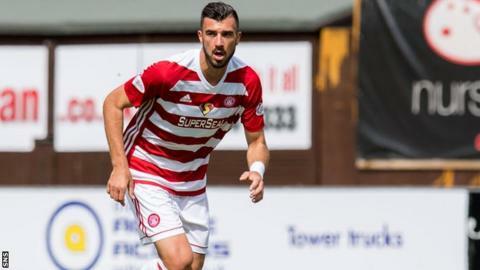 Hamilton Academical manager Martin Canning insists defender Xavier Tomas has to take more responsibility after watching his side slip to a sixth successive defeat. To make matters worse, Accies have taken the lead in their past four matches but ended them pointless. "It's driving me crazy. We're so naive defensively it's scary," said Canning after the 2-1 defeat at Ross County. "Big Xavier has got to do more, he's got to be more of a leader in there." And he added: "That's putting a bit more responsibility on Xavier, but as a senior pro in there, he's got to stand up to that." Accies took the lead through Greg Docherty in Dingwall but goals from Alex Schalk and Thomas Mikkelsen won it for the hosts. Just as they did against Motherwell, Rangers and St Johnstone, Hamilton surrendered the three points after taking the lead. "It's difficult to take," Canning told BBC Scotland. "It's yet another game we take the lead, looked comfortable and we find a way to lose. "Late in the game it's the same thing that's causing us problems again - it's a lack of leadership and a lack of someone taking control and making sure we're organised. It's a sore one again. "We're turning into experts at finding a way to lose a game, which is really frustrating. I think that's four of the last six we've gone ahead and we've lost every one of them. "We're competitive and we're giving ourselves the best opportunity to win these games and take points, but when you're as naive as we are at the moment, it's costing us. We need to get one or two of the injured boys back, a bit of experience in the team, and hopefully that will help us out." Canning admitted the pressure "increases on everybody" with each defeat but he refused to blame his side's form on a recent fraud that affected the club's finances. "That's got absolutely nothing to do with what's going on on the park," he said. "What's happened off the park, the club have dealt with brilliantly. The owners have put the players' minds at ease. On the park is my responsibility and the players' responsibility. "I'm confident with this group that we'll turn it round and start winning games again." Staggies manager Owen Coyle was happy to get back to winning way following last week's defeat at home to Hearts. "We had a slow start but after that we dominated," he told BBC Scotland. "The important thing was how we reacted (to Hamilton's goal), and it was there for everyone to see, we scored two wonderful goals. "We could have had more if truth be told; their goalkeeper had some terrific saves. Anyone who came here today could see that Ross County were the better side. The pleasing thing for me was considering the club hadn't won a home league game this year it was important to do that as quickly as we could."